Cosmetic Boxes Manufacturer We are responsible manufacturers Special Boxes. They are available in variegated shapes, sizes, designs and patters, colors as per clients specifications. They are tested on various parameters by our supervisors. Printed Corrugated Boxes Manufacturer Printed Corrugated boxes with matte and gloss finish are available in various customized sizes as per the customer's requirement. This box is of 600 gsm E-flute corrugated box printed in multi-color. 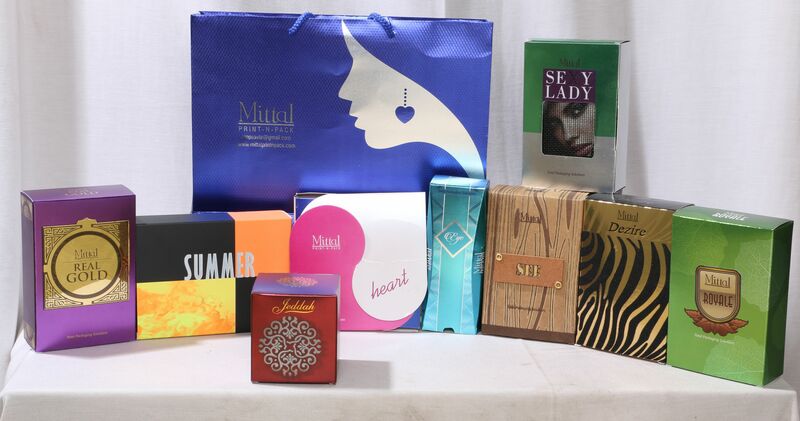 Metallic Perfume Boxes Manufacturer We are self-reliant manufacturers and supplier of perfume cartons. They are available in different sizes , shapes, designs and color patterns. They can be customized too as per clients specifications. They are well attested by our experts in various areas. Perume Flocking boxes. Specially crafted for Ajmal perfumes, this box resembles cheetah pattern. Multi color printed on virgin boards and black color velvet applied post press. Flocking is available in multiple colors. Black and white are most popular. Send us your artwork and our team will get back to you on applying this effect. However this effect requires quantity. Flouroscent Boxes. Mono cartons printed with special inks to give bright look. These are available in foldable boxes and rigid boxes category. These boxes were specially designed for Beauty World Middle East 2017 exhibition. The response for these boxes have been very good with all age groups.